Meet at a street art gallery before exploring the underground graffiti scene in Austin. Discover long walls covered in dozens of pieces, large-scale professional productions, and identify small street tags and stickers. Then, learn how to spray paint your own piece with the help of local artists. We'll meet at SprATX—pronounced Spray Tee Ex. This shop is the social hub of the street art scene; every insider can be tied to this place. We'll then walk the streets of East Austin. The murals and quirky shops make this the unofficial art district— for many locals, this is our favorite area. We'll paint at HOPE Outdoor Gallery. 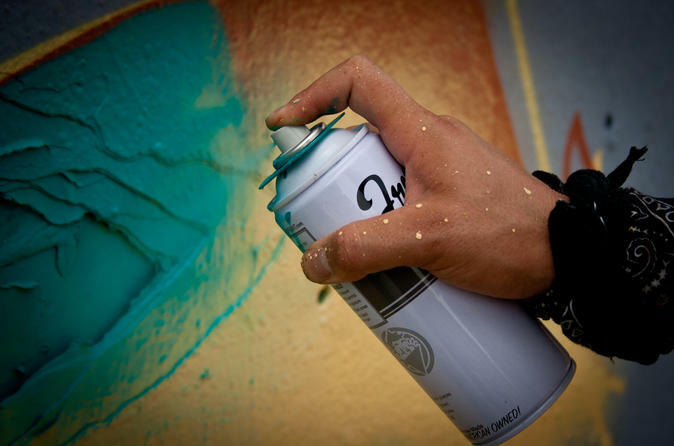 It's made up of more than 40 abandoned walls that have been turned into a spray painting free-for-all. Guests should bring shoes to walk off-road, since we'll walk along some railroad tracks. It's Texas, so you'll probably want to have a water. I'll have bottled water for you as well. If our adventure is during your usual dinner time, you might want to eat before hand or bring a snack. I'll have some granola bars available for you also.